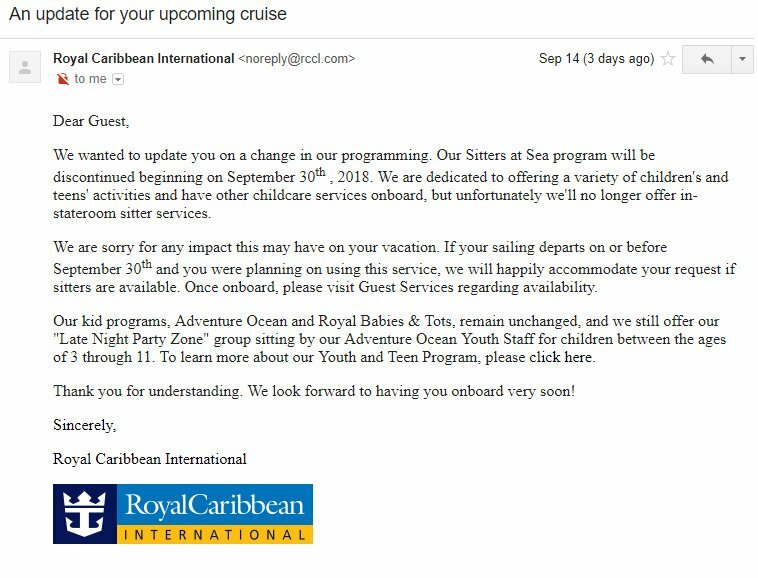 Royal Caribbean informed guests via email that it will be discontinuing its in-room babysitting service as of September 30, 2018. Known as Sitters at Sea, Royal Caribbean intends to no longer offer in-stateroom sitter services. Royal Caribbean offers on most, but not all, of its ships a nursery for children that are up to 3 years old. Any sailings departing on or before September 30 will still offer Sitters at Sea upon request and subject to availability. Guests can inquire at Guest Services onboard for further information. The cruise line also re-affirmed its dedication to offering kids programming on its ships. Its Adventure Ocean and Royal Babies & Tots program will remain unchanged, and Royal Caribbean will still offer "Late Night Party Zone" group sitting by our Adventure Ocean Youth Staff for children between the ages of 3 through 11. The Sitters at Sea program was a service by Royal Caribbean where guests could inquire if any crew members were willing to baby sit children in a guest stateroom. The advent of nurseries on many Royal Caribbean ships has likely seen demand for in-room babysitting dwindle in recent years. The remaining Royal Caribbean ships without a nursery are Empress of the Seas, Majesty of the Seas, Jewel of the Seas, Adventure of the Seas, Explorer of the Seas and Voyager of the Seas. We have reached out to Royal Caribbean for further information.